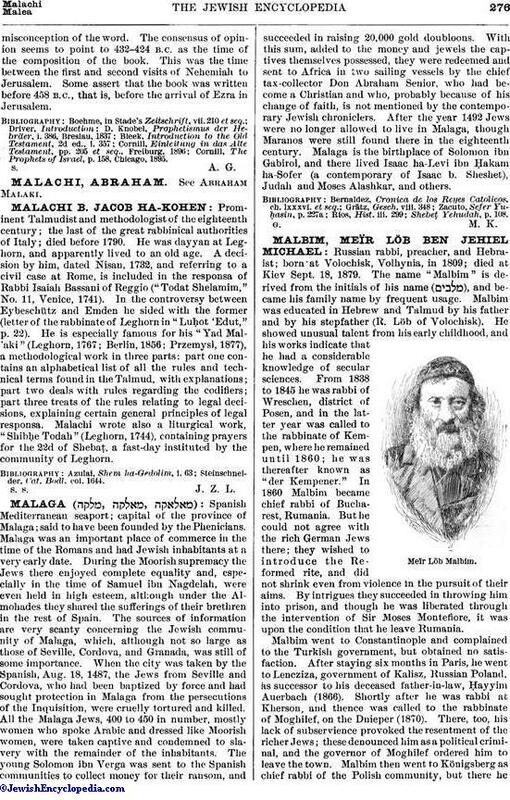 Russian rabbi, preacher, and Hebraist; born at Volochisk, Volhynia, in 1809; died at Kiev Sept. 18, 1879. The name "Malbim" is derived from the initials of his name ( ), and became his family name by frequent usage. Malbim was educated in Hebrew and Talmud by his father and by his stepfather (R. Löb of Volochisk). He showed unusual talent from his early childhood, and his works indicate that he had a considerable knowledge of secular sciences. From 1838 to 1845 he was rabbi of Wreschen, district of Posen, and in the latter year was called to the rabbinate of Kempen, where he remained until 1860; he was thereafter known as "der Kempener." In 1860 Malbim became chief rabbi of Bucharest, Rumania. But he could not agree with the rich German Jews there; they wished to introduce the Reformed rite, and did not shrink even from violence in the pursuit of their aims. By intrigues they succeeded in throwing him into prison, and though he was liberated through the intervention of Sir Moses Montefiore, it was upon the condition that he leave Rumania. Malbim went to Constantinople and complained to the Turkish government, but obtained no satisfaction. After staying six months in Paris, he went to Lencziza, government of Kalisz, Russian Poland, as successor to his deceased father-in-law, Ḥayyim Auerbach (1866). 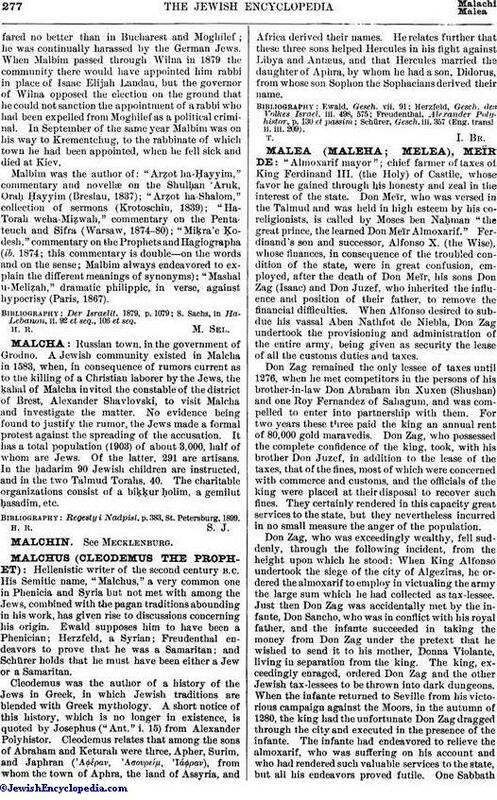 Shortly after he was rabbi at Kherson, and thence was called to the rabbinate of Moghilef, on the Dnieper (1870). There, too, his lack of subservience provoked the resentment of the richer Jews; these denounced him as a political criminal, and the governor of Moghilef ordered him to leave the town. Malbim then went to Königsberg as chief rabbi of the Polish community, but there hefared no better than in Bucharest and Moghilef; he was continually harassed by the German Jews. When Malbim passed through Wilna in 1879 the community there would have appointed him rabbi in place of Isaac Elijah Landau, but the governor of Wilna opposed the election on the ground that he could not sanction the appointment of a rabbi who had been expelled from Moghilef as a political criminal. In September of the same year Malbim was on his way to Krementchug, to the rabbinate of which town he had been appointed, when he fell sick and died at Kiev. Malbim was the author of: "Arẓot ha-Ḥayyim," commentary and novellæ on the Shulḥan 'Aruk, Oraḥ Ḥayyim (Breslau, 1837); "Arẓot ha-Shalom," collection of sermons (Krotoschin, 1839); "Ha-Torah weha-Miẓwah," commentary on the Pentateuch and Sifra (Warsaw, 1874-80); "Miḳra'e Ḳodesh," commentary on the Prophets and Hagiographa (ib. 1874; this commentary is double—on the words and on the sense; Malbim always endeavored to explain the different meanings of synonyms): "Mashal u-Meliẓah," dramatic philippic, in verse, against hypocrisy (Paris, 1867). S. Sachs, in Ha-Lebanon, ii. 92 et seq., 106 et seq.